Abstract: Networking related products like this 1U rack mountable DSR2216 16-Port 10/100 switch which retails for about $250 CDN. COMPEX is one of the larger networking manufacturers on the market and the maker of the DSR2216 16-Port 10/100 Rack Mountable Switch we are looking at today. After all a good switch is an often overlooked piece of equipment, and heck it might just be able to smooth some packet collisions out in our weekly CS/RTCW matches! 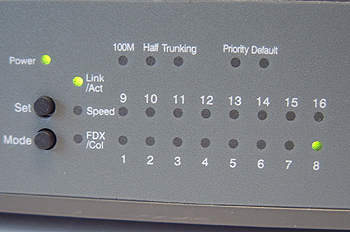 COMPEX was established in 1987 and focuses on Networking related products like this 1U rack mountable DSR2216 16-Port 10/100 switch which retails for about $250 CDN. This is a pretty competitive price for 16 ports, and the rack mountable case is great to see (the tabs come off if you simply need a desktop switch). The DSR2216 has a host of features such as Port Priority, Full Bandwidth switch architecture, Duplex mode and several Port Trunking options. 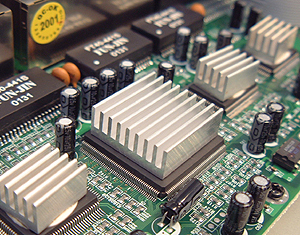 So what exactly is a network switch? Unlike hubs or repeaters, the main point of switches is that they are not limited to an internal bandwidth of 100Mbps (Megabits per second). Rather each port has it's own personal 100Mbps pipeline. Therefore, if three or more devices are connected to the DSR2216 and they were each sending data, the bandwidth would not be shared and thus wouldn't slow down. 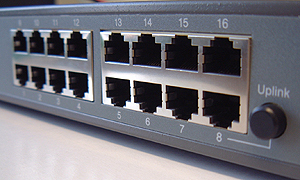 Switches are of course mainly known for their ability to negotiate packets of data so there are no collisions. The DSR2216 acts like a traffic cop and directs the data/traffic to it's appropriate port. Since the data has its own dedicated path no other data can get in the way and slow things down by causing collisions. Port Priority is one of the features on the DSR2216 which allows it to assign certain ports more priority (obviously) for bandwidth hungry applications like servers or VoIP hardware. Since it's a switch, even if all 16 ports are being used simultaneously there should be no slowdowns as you may experience with a hub where data is being broadcast to every available port no matter who requested the information. The DSR2216 allows the system administrator to force any operating mode you like on any particular port which gives users more control without needing to connect up a serial cable. Should you want to do that, your options would be 100Mbps at half duplex, 10Mbps half duplex and 100Mbps full duplex. 10Mbps at full duplex is not supported with the DSR2216. There's also a feature called Port Trunking which allows the user to configure up to 800Mbps worth of bandwidth between two DSR2216 switches. To accomplish this the user connects two, three or four pairs of cable up to the other switch which allows for high speed communication between the two switches at up to 800Mbps. Even for a networking newbie such as myself, I didn't have a hard time configuring the Compex switch or reading through the short manual. It's also not hard to force the mode you want; let's say you wanted to use 100Mbps at full duplex. To do this all you would have to do is press the mode button till the 100M LED lit up, then press the set button till the port you wanted also was selected. Now simply press and hold the set button for three seconds till all the port LED's flash and turn off. Now they're running in 100Mbps at full duplex. This is great if you want to limit the ammount of bandwidth a computer has and at full duplex mode, your bandwidth is effectively doubled, however sometimes NIC's have trouble running that fast. We created two 512MB dummy files and used Windows Explorer to drag and drop the two files from one computer to the other. The IDE controllers on both computers ran at Ultra/100 with DMA enabled. As you can see, 100Mbps is definitely the way to go. the data transfer is so much quicker (you already guessed that though). It was also nice to see there were no collisions during the file transfers. We were actually pretty impressed by the COMPEX DSR2216 16-Port Rackmountable Switch. With a retail price of $250 CDN it would be quite inexpensive for a rackmountable hub let alone a rackmountable switch! And with so many features such as Port Priority, Full bandwidth Architecture and Port Trunking, COMPEX has surely taken care of many possible networking bottlenecks that could pop up! I think the DSR2215 has made our CS/RTCW matches more lively; gone are the lost packets because of collisions and now there really are no excuses. (okay okay that really isn't a good example :). The build quality of the DSR2216 was top notch, everything was well laid out and easy to read and the manual was quite user friendly. With my basic knowledge of networking, I didn't find it hard, or intimidating, to properly configure the switch to optimum settings. It's nice to see a manufacturer take the extra step to ensure that their customers have as few problems as possible and we salute COMPEX for the "little" things that were done right. Good job.